The durably waterproof and breathable GORE-TEX® liner used in many of our boot models keeps feet dry and provides optimized climate comfort for all seasons. The microscopic pores of the membrane are 20,000 times smaller than a drop of water but 700 times larger than one vapor molecule. Water cannot penetrate while perspiration can easily escape. Considering specific requirements for climate, activity level and environment, GORE developed specialized laminates for footwear. The Performance Comfort Laminate, used in the Protector Prime Series, is moderately insulated for a broad range of temperatures when the weather is changing. 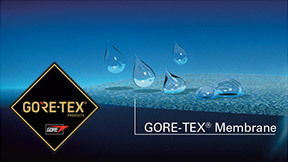 The Extended Comfort Laminate, found in the Black Eagle Tactical Series, is non-insulated for high heat loss. This is ideal for outdoor activities in warm weather.